Backdrops of serene natural landscapes and soothing color palettes contrasted with a natural calamity and power packed Punjabi performances in a wedding that truly did have it all! Sakshi and Mayank left no stone unturned putting together an extraordinary celebration but it will always be the earthquake that struck Bali during their pheras that will take all the credit for their “rocking” celebration! The bride shares with us the details of when she felt the earth move as well as photographs clicked by WeddingSutra Favorite ShutterDown. "Our dads were friends and introduced us. They were actively hoping we’d get married but they also left us to ourselves after they set up our first meeting. So, our relationship developed organically. We got along very well. We become great friends and eventually love followed." "Before asking me to marry him, Mayank first spoke to my parents. Then in Nepal, he popped the question!" "We wanted a destination wedding and decided on Bali. Neither of us have any great love for beaches though. This destination just happened to be close to Singapore where Mayank and his family live and it is also accessible from Delhi where my family is based. Mayank and I actually love the mountains so we chose the Renaissance Bali Uluwatu Resort & Spa, which is a cliffside resort. We went there for a recce and loved it immediately." “Innaz Communique and Inayat Khubchandani and his team were just spectacular. As wedding planners, they have a set of great vendors on board and are very systematic. When we went to meet them and finalize everything, they had time allocated to choose decor, vendors, etc. Everything they do is so well organized. They really are the best. Savleen Manchanda was my makeup artist. She is fabulous at what she does and quickly understands what you want. I wanted subtle makeup and every look that she created was both unique and in alignment with this core concept. ShutterDown photographed our wedding. They are such a warm bunch of people that our family and friends took no time getting comfortable around them. Even when they were photographing me, they did not make me feel conscious at all. While they are super dedicated, they are also a very fun team to work with. They were clicking pictures till 1:30 a.m. even on the last day. That’s when I finally told them to put down their gear and join the party and they were up for that! They work hard and party harder which is what adds to the enjoyment at your wedding. They are a team that I would recommend to every couple. Butterfly Event Styling were our decorators. We met them through Inayat and in just a few meetings they were able to understand our vision perfectly. This was an area that was especially important to me and their excellent execution really exceeded my expectations." "The décor for this evening was my favorite. We had a rustic-boho theme so we used a lot of crochet elements, green leaves, pineapples, and various vases. Every table had a roof-like structure with leaves and lamps and the most eye-catching element here was our massive wedding hashtag which was propped up on a high stage. 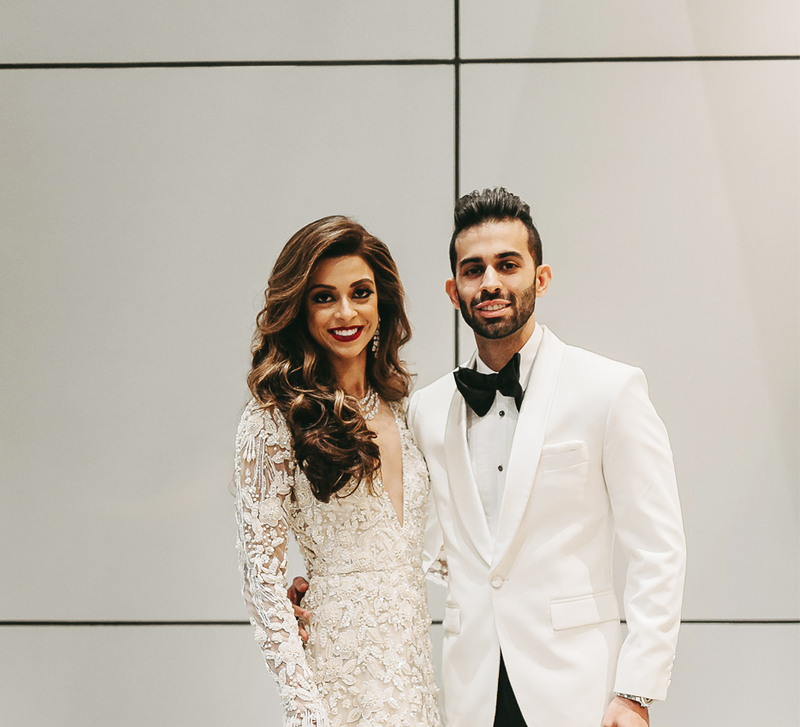 I wore a dusty pink Gaurav Gupta gown and Mayank went with a custom-made suit from Suitsupply Singapore." 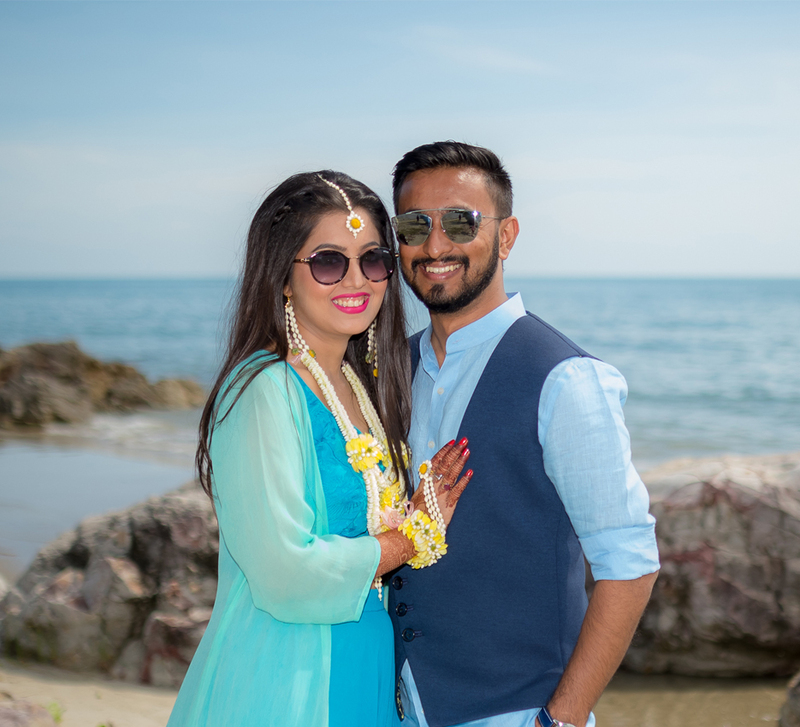 "Our mehndi was hosted at the Roosterfish Beach Club which made for a refreshing change. Our beach loving guests of course were thrilled. The decor for this function was pastel orange and blue. We refrained from decking the place up with too many elements since the venue itself was so beautiful. This function saw dances by our family and friends and had a very lively vibe to it. An off-white kurta and bandi by Varun Bahl was Mayank’s pick and I opted for a hot pink outfit by Arpita Mehta." "Wood was a big part of the setup for our cocktail party and the highlight was the island bar that decorated using large branches, lots of leaves and fairy lights. We had RDB, a Punjabi band, perform for us and this function was an out-and-out Punjabi party with lots of drinking and dancing. Even our non-Indian guests had a blast at this event. 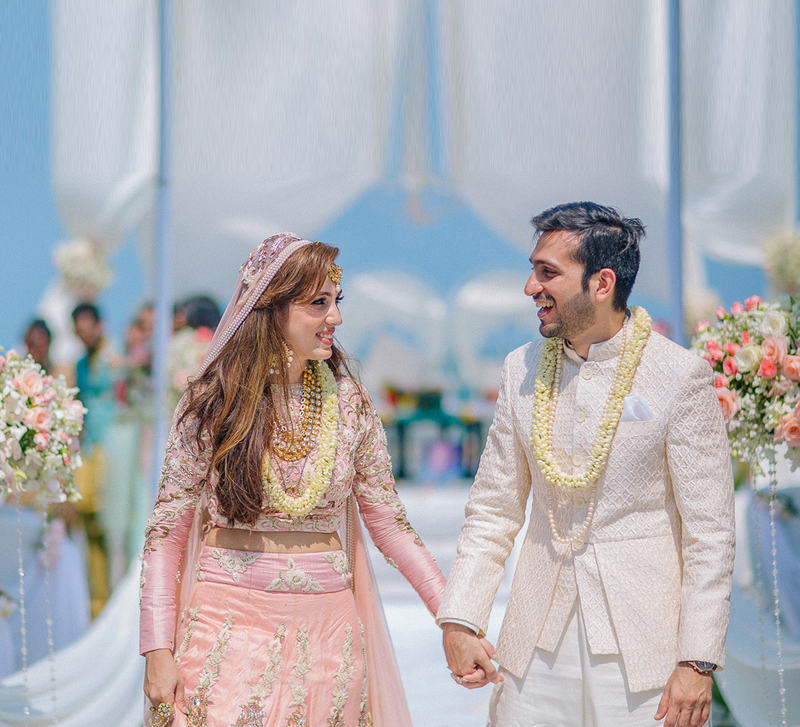 I wore a gown by Shantanu & Nikhil and Mayank chose a Jodhpuri by Varun Bahl." "We had planned to have our pheras at sunset and the setup with water and mountains in the background was simply stunning. Soft pink, peach, and white were the colors that we used across the décor via flowers and drapes and chandeliers for a romantic touch. While the decor was beautiful, the most unforgettable thing about the wedding was the earthquake that hit during the ceremony! Although at the moment we were all quite scared, in retrospect everything seems hilarious. A few of our guests left the venue to go to a large open area, Mayank and I were wondering if we should leave too but the pundit kept reassuring us that this was only the gods blessing us. However, at some point, he too seemed to lose faith because he started chanting the mantras really fast. Our family and friends who were sitting there kept cracking jokes. The scene was rather comical! For this ceremony, Mayank and I wore Sabyasachi." 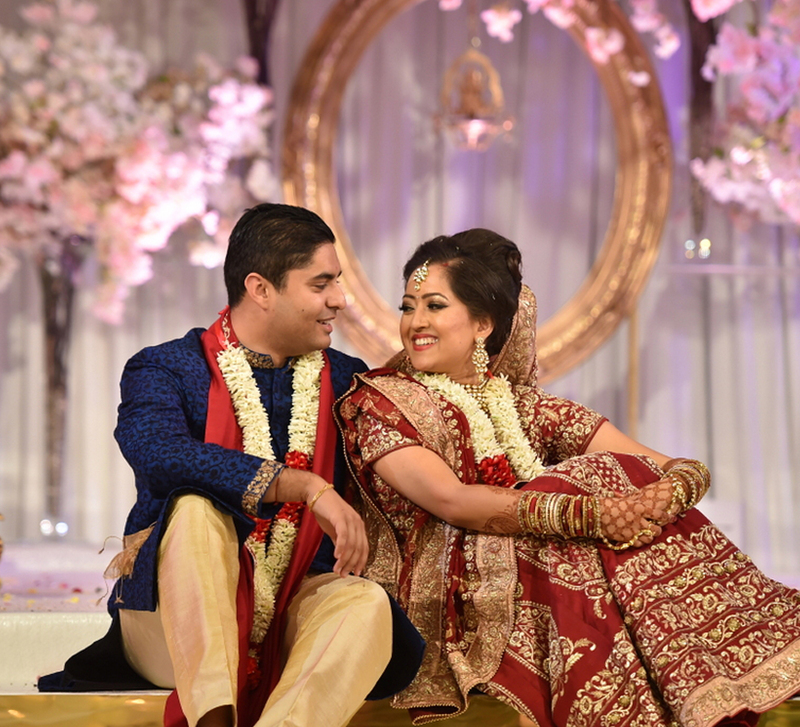 "Mayank and I really enjoyed not just being at our wedding but planning it too. The key to that is to not get hyper. As the bride, it is not possible for you to be everywhere and the sooner you realize that the faster everything will get easier for you. Delegating a lot of duties will help you let loose. Focus on having fun, making the sweetest memories and being a queen for those days!"